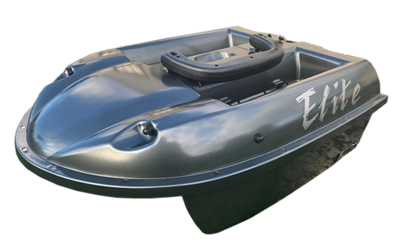 A Bait Boat or Baitboat is in basic terms a remote controlled boat designed specifically for Carp, Cat or Pike fishing in mind. 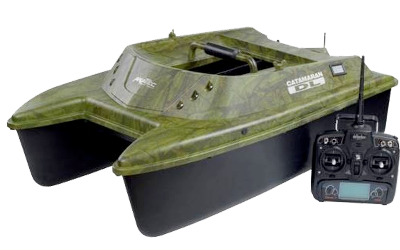 Also availabel for most of the boats that we sell are fish/feature finders / echo sounders which allows the angler to see the exact depth and terrain under your boat from the comfort of the bank side displayed on LCD screens. These are great for mapping out lakes and finding holes and underwater ledges. How Do Bait Boats Work? By the use of the handset controls, which vary for each boat, you have the ability to drop the bait exactly where it's required. Once in position all that is required is a quick shift of the hopper control, the door or doors is opened and the bait is delivered, some boats have the option to attach your rig to an external rig dropper. If your model doesn’t have that feature, simply pass your rig up underneath the hull and into one of the hoppers, closing the door will hold your rig securely in place. It’s important to steer in as straight line as possible as tight turns could cause your main line to tangle under your boat. 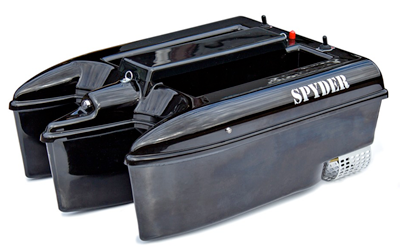 Is Using A Bait Boat Cheating? Online, magazines and even on the bank side there will always be a discussion with anglers for and against Bait Boats. Used respectively of other fisherman around they can not only be used for distance but also accuracy, with the advantage of placing a rig tight to an island or reed bed. Negativity we hear from anglers, particularly fishing larger waters with no islands, where there is no exact cut off point as to where they can or can’t take out their bait. Problems can occur with users going too far out beyond where they should do. Heading around islands out of sight is obviously something that should be avoided. Like most things you get what you pay for, buy cheap, buy twice as the saying goes. 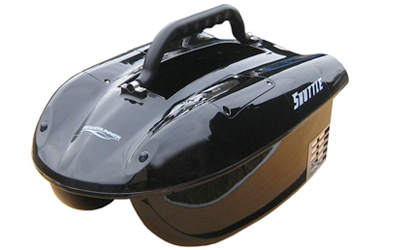 Some angling items you are paying a premium for the badge, but from our experience, with bait boats the more you pay, the more you are rewarded with better components and overall build quality. Basic lower end models start from £400 up to £1100 for the top models. There is no oil change or spark plugs like you get on a car so we say carry on using your boat and only send it off for repair work if/once a problem does occur. We suggest wiping down your boat after every session with warm soapy water paying particular attention to inside your hopper doors, stopping them from sticking on future sessions. Baby wipes are also a great accessory. All boats should be storred in dry and not damp conditions, very important. 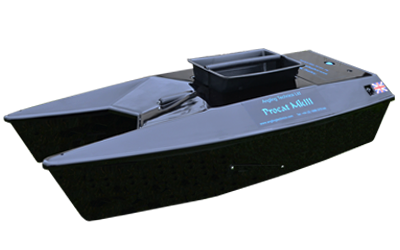 Choosing the correct boat can be a difficult decision to make, not only financially but also finding a package that exactly caters for your needs. Without help and advice from a dedicated team of professionals it can be a daunting task, this is where we come in. We have tried, tested and maintained every boat currently available, therefore we are able to give customers first hand knowledge of what would suit their requirements and budget. Our store is open six days a week for customers to reach us via phone, email or if you want to pop in for a chat and view our products please feel free. Best check stock levels before coming down as it could vary slightly online to what we have in store. Please also note we close our store on the first Saturday of each month. Best check opening times during Eatser, Christmas period.